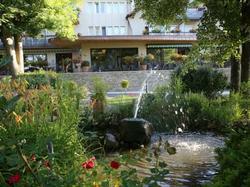 Located a 5-minute drive the centre of Altkirch, Auberge Sundgovienne offers a garden, terrace and elevator. Basel, where the French, Swiss and German borders cross is just a 35-minute drive away. All rooms are air-conditioned and feature a TV, minibar, safety deposit box and a wardrobe, while some also include a separate seating area. The en suite bathroom includes a shower or bathtub and free toiletries. A buffet breakfast is offered at the hotel .Regional dishes made with free produce are available in the restaurant and are served inside or on the terrace. Guests can also enjoy a drink in the hotel's bar. Mulhouse is a 30-minute drive away and Moslargue Golf Course is 18 km from the hotel. Wi-Fi access is available at the hotel and free private parking is possible on site. Please note that the reception is closed on Sunday Monday, guests arriving on these days will be received an entry code and the keys will be left at reception. Please note that the restaurant is closed Sunday evening, all day Monday and Tuesday lunch. This air-conditioned suite features a separate seating area, a TV and minibar. The en suite bathroom includes a bathtub and free toiletries. Divided into 2 connecting rooms, this air-conditioned room features a TV, minibar, safety deposit box and a wardrobe. The en suite bathroom includes a shower and free toiletries. This air-conditioned room features a TV, minibar, safety deposit box and a wardrobe. The en suite bathroom includes a bathtub and free toiletries. This air-conditioned room features a TV, minibar, safety deposit box and a wardrobe. The en suite bathroom includes a shower and free toiletries.